(by The Wall Street Journal editors) — Tumbling energy prices are the first lucky break for U.S. consumers in years, but Washington is feeling left out. So the gougers of both parties are joining to steal some of the proceeds with the first gasoline tax hike in more than two decades. The federal gas tax is now 18.4 cents a gallon and the logic seems to be that motorists won’t notice an extra dime or more since gas prices are down 40% on average from the 2014 peak. Congress can then “invest” the windfall in roads, bridges and other projects. A convenient pretext for a tax increase arrives in May with the expiration of a temporary highway funding bill, and many otherwise intelligent Republicans are open to the idea, perhaps as a tax swap. …As one of its first major acts, the new Republican majority would make the commodity that most Americans must buy every week more expensive, offsetting the discretionary-income gains from cheaper gas. Republicans should be talking about downsizing the federal gas tax instead, with a target of zero. The gas tax – plus a 24.4 cent tax on diesel and other excises – finances something called the Highway Trust Fund, or HTF. The proceeds from the original 1956 three-cent tax built the interstate highway system and its expansion and upgrades over the decades. The tax was increased in 1982, 1990 and 1993. The problem is that since 2008 federal HTF spending has far outpaced dedicated gas-tax revenues, and Congress has made up the difference with $54 billion in cash transfers from general revenues. To cover future HTF obligations and close the deficits, fuel taxes need to rise by 10 to 15 cents a gallon, according to the Congressional Budget Office. The solons [wise politicians] now claim the arc of history bends toward precisely that. The real purchasing power of 18.4 cents has slipped amid inflation and the rising cost of labor and materials. Vehicle miles travelled are plateauing and cars are more efficient, eroding the projected growth of the tax base. But since the 1990s, the Highway Trust Fund has come to fund much more than new roads and bridges and highway maintenance, abandoning the original “user pays” principle behind a gas tax. Drivers now see about a quarter of their gas taxes diverted to subsidize mass transit in merely six metro areas and sundry other programs for street cars, ferries, sidewalks, bike lanes, hiking trails, urban planning and even landscaping nationwide. Trolley riders, et al., contribute nothing to the HTF. Federal spending on such side projects has increased 38% since 2008, while highway spending is flat. Here’s what the politicians won’t say: Simply using the taxes that are supposed to pay for highways to, well, pay for highways makes the HTF 98% solvent for the next decade, no tax increase necessary. Your local interstate will not close if HTF “goes broke.” The feds will continue to spend all the money that the gas tax will continue to throw off. Some projects would merely be delayed, or states and cities would fill the gaps. Some highways do need repair and modernization, and the U.S. does need more roads to relieve congestion and encourage trade and economic activity. The real crisis isn’t the amount of money but how it is spent. The 47,714 miles of the interstate highway network would likely be less complete absent federal support, but the system was officially finished in 1992. It is less rational for drivers nationwide to send so many dollars to Washington for Congress to apportion among winners and losers as they did under Eisenhower. Today, the costs of transportation can be reasonably borne by the people who enjoy the benefits, which will generate more accountability and fewer political boondoggles. In an ingenious 2013 paper, Pengyu Zhu of Boise State University and Jeffrey Brown of Florida State studied federal highway spending between 1974 and 2008. They found that the gas tax tended to redistribute money from poorer to wealthier states and to regions with lower transportation needs than other parts of the country. Texas recovered only 88 cents of every dollar residents paid in taxes, while seven states and Washington, D.C. (no surprise) received more than twice as much. Such misallocated resources are the inevitable result of the political mediation of the HTF. Almost three-quarters of highway spending is already supplied by state and local governments, and if the federal role is reduced, they can decide either to increase their own gas taxes; fund roads some other way, such as tolls or public-private partnerships; or use tax dollars for other priorities like schools. States can build cheaper in any case, since the Davis-Bacon prevailing wage rules and Buy America procurement provisions that accompany federal funding don’t apply. Democrats always want to raise the gas tax. When prices are high, that’s the best time to encourage drivers to buy an electric car or take the bus. When prices are low, they can skim some of the proceeds for other spending. The mystery is why Republicans would go along. Published Jan. 14, 2015 at The Wall Street Journal. Reprinted here Jan. 29, 2015 for educational purposes only. Visit the website at wsj .com. NOTE to students: Ask a parent to read the editorial and discuss your answers to the following questions. 1. What is the main idea of the WSJ editors’ commentary? Are you surprised by this assertion? Explain your answer. Do you agree or disagree with this assertion? Explain your answer. 4. 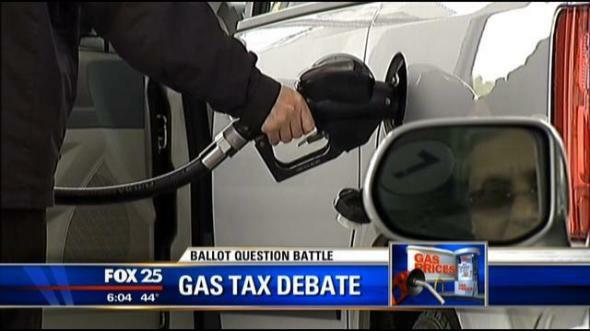 Since gas prices have gone down so much, do you think it’s ok for Congress to raise federal gas taxes? Explain your answer.